OCMS offers 3 mixed-age Children’s House classrooms dedicated to our students age 2 years 9 months (2.9) to 6 years. Each classroom has approximately 24 students and is guided by an AMI certified Montessori guide and an assistant. Through a sensorial approach to the young child’s learning, the Children’s House experience builds the necessary framework for academic and social growth, developing a spirit of curiosity and independence to inspire a lifelong love of learning. 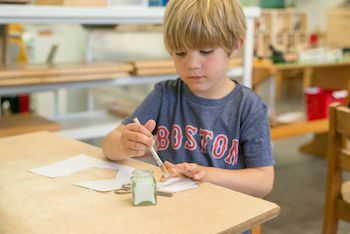 There are five central components to the Montessori Children’s House program, and within each group are specially prepared, manipulative materials. Rhythm is something Jackie knows a lot about. She also teaches Music Together at the South Shore Conservatory, and you’ll often see her on the playground with her guitar and singing children. Everyday activities related to the care of oneself and the care of the environment. Activities of increasing complexity are designed to help refine a child’s senses. Using strategically developed materials, children gain a solid foundation with numbers, exploring the four math systems: addition, subtraction, multiplication, and division. Utilizing a combination of phonics and whole language techniques, each child is guided through spoken language to writing, reading, and comprehension. Exposure to geography, history, and science through concrete materials as well as oral and written stories, children expand their understanding of the surrounding world.